With the recent online boom of daily fantasy sports at sites such as DraftKings and FanDuel, it was only a matter of time before similar niches started developing to take advantage of the huge success of DFS. Introducing “Daily Fantasy E-Sports” and sites like Vulcun who run fantasy games for money for esports events with pros competing playing games such as League of Legends and DOTA 2. Vulcun.com features a very similar setup to DraftKings.com and prize pools are slowly growing comparably into the millions of dollars range. Recently, Vulcun completed a $12 Million round of funding via a host of venture capital firms. This quickly places Vulcun atop the fantasy esports world giving them the ability to offer players the kinds of huge payouts that will attract fans worldwide trying to get a piece of the action. Vulcan.com will also be using the capital to build out its network of game offerings expanding from popular titles such as League of Legends, DOTA 2 and CS:GO. Because fantasy sports online and now fantasy esports is deemed legal in the USA because of the carve out in the UIGEA, Vulcun and other large fantasy e-sports operators such as Vulcun and AlphaDraft have exponential room to grow quickly and legitimize the industry amongst gamers and interested public audiences. And, with the huge success to date with fantasy sports sites and marketing deals with major sports leagues it is only a matter of time before companies such as EA Sports and Take Two Interactive sign deals to help with advertising this online phenomena worldwide…after all everyone follows the money trail. 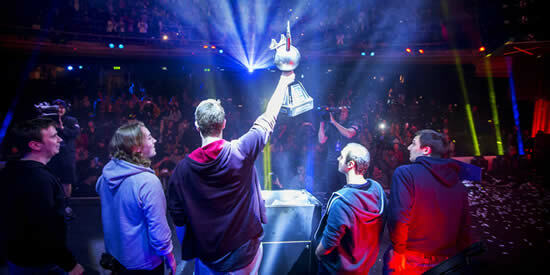 Fantasy E-sports is worth checking out, as there is real money to be won while being entertained. 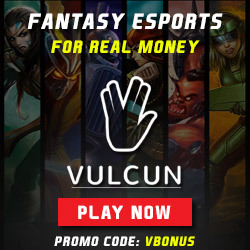 To get in on the action and check it out, take advantage of the new player bonus Vulcun is offering and sign up to Vulcun.com using promo code VBONUS. Vulcan will give you $5000 in gold, 15 extra FREE loot crates and a 100% match on any gold purchases.